 Judith Perera, "Nuclear Industry of Egypt," March 2003, p. 23, www.opensource.gov. The 14 February 2005 IAEA report lists the ETRR-2 as a 22.5MW research reactor. However, the Egyptian Atomic Energy Authority and INVAP websites, and the IAEA research reactor database (www.iaea.org/ worldatom/ rrdb) all list the ETRR-2 as a 22MW reactor. Thus, it appears that the more widely used 22MW figure is accurate. Nuclear Programmes in the Middle East: In the Shadow of Iran, Mark Fitzpatrick ed., (London: The International Institute for Strategic Studies, 2008), p. 22. IAEA, "Implementation of the NPT Safeguards Agreement in the Arab Republic of Egypt: Report by the Director General," 14 February 2005, p. 2, www.carnegieendowment.org. For additional design specifications see: Judith Perera, "Nuclear Industry of Egypt," March 2003, p. 23, www.opensource.gov. 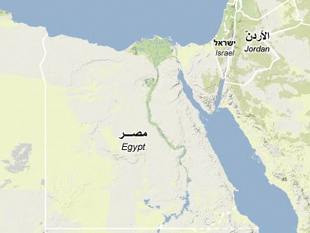 INVAP, "Reactor ETRR-2 (Egypt)," www.invap.net. "Egypt's Budding Nuclear Program," Wisconsin Project on Nuclear Arms Control, The Risk Report, Vol. 2, Number 5 (September-October 1996). Barbary M. Gregory, "Egypt's Nuclear Program: Assessing Supplier Based and Other Developmental Constraints," The Nonproliferation Review, Fall 1995, p. 3.